In our latest pre-release version, we’ve made two changes to the reactor <-> stabilization mechanic to make it more dynamic, and tie a new gameplay aspect to it. The first change is how stabilization affects your reactor power generation to make it a lot more dynamic by introducing more risk-reward for building in a certain way, and to make the stabilizer distance curve less of an obstruction. Players are now able to get full power regeneration at a low level of stabilization, currently set at only 25%. This allows you to get much more raw power which directly translates into more firepower, more mobility and functionality. Essentially this means, you can build the same amount of stabilizers either 75% closer, or 75% smaller at optimal distance without any power penalty. However, there will be negative effects in place to make you consider getting more stabilization than the bare minimum, besides not running into a power reduction as soon as you drop below 25% in combat. We’re still working on these negative effects, but each effect would be limited to a phase between a minimum and maximum % stabilization for each. Possible effects include extra damage to systems, explosions, or up to direct reactor damage upon any hit. All of this will be available in the blockBehaviorConfig. If you have any ideas for possible effects, feel free to share! Any stabilizer group and its active reactor now gets a non physical beam that connects the two groups together. This beam is automatically created and can be redirected through energy stream nodes. A node is a simple block that will be used as a waypoint for the beam to find its stabilization group. They can be made into a path by connecting them into a chain. The start and end point of this stream will always be the active reactor and a group of stabilizers. Here are two energy streams, each connected to their stabilizer group. The width of the stream depends on the reactor size, but is distributed over the stabilizer group sizes. This stream, while non physical, can still be hit by weaponry. Any damage dealt to the stream will instead be redirected to your reactor power generation in some way. In the current build, it simply disables your power regeneration for a few seconds for testing purposes, but this mechanic will be changed to a more dynamic mechanic. A reasonable one would to have the damage to the stream, apply damage to its stabilization group instead. It is very easy to hit if exposed, as you can "cut" through it with a beam. The main purpose of this stream is to emphasize on the stabilizer-reactor relationship. Block conduits between reactors have been ruled out before not only for performance and scalability reasons, but also for the possibly difficulty in maintaining them. We were looking for a system that would incerease the role of the stabilizer-reactor relationship, while not being too bothersome to maintain, too complicated, abusable, or imperformant. 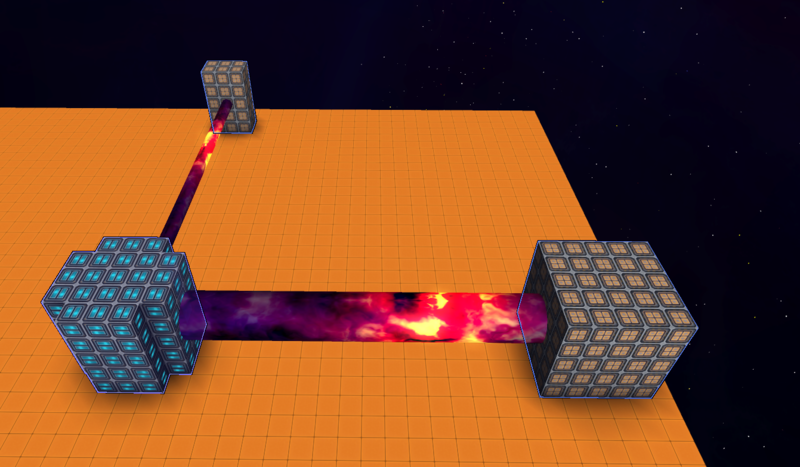 Since the energy beam is generated and its effects visible it should be a natural progress for the player to undertstand its mechanics. It is also versatile enough to allow for a lot of ways to balance, as that would also be very hard with block conduits. Group integrity creates the decision to either make denser stabilization groups or suffer from extra block damage if hit. It also results in a long and wide stream, making it easier to damage this particular group by hitting the stream. This mechanic should encourage to make more than just one stabilization group, and in different locations to prevent the same hit from damaging multiple streams. It also makes any “island” ship pretty much impossible to fully protect as now there is also a visually exposed stream to target. You would need to visually hide this stream and try to protect it as best you can. We also hope that these changes will make other shapes more interesting for ship building. An example would be a ring of stabilizers around your reactor to minimize the energy stream. However that doesn't have any inherit advantage, since the ship is still as vulnerable as other ships, maybe even more so. A line ship might be an efficient shape, but a dangerous choice as any breach in that line exposing the single energy stream might lead to its downfall. Stay tuned for more information on the release, as well as more news for the upcoming weapon update. Finally we’ve reached the point where we enter a pre-release state. This means that all the needed features are in, and preliminary bug fixing is done. There will still be issues, and while it should run fine, we strongly advise to backup your universe or try it out on a separate installation. It can be downloaded and installed from the Pre branch. If you’re not too sure about it, feel free to contact @Lancake in a private conversation, or leave a comment on this thread. While we wait on people to try it out and report issues, we’ll continue building on features for the update after this. What follows, is a quick overview of what’s new compared to release. We’ll make a more in-depth version for the actual release. * HUD context filters: all, most, some, crucial only, none. Crucial only is advised for experienced players. As you can see, a lot of optimization was done so make sure keep your eye out for graphical glitches, block grouping bugs and block destruction issues. In case you’re interested to see which issues occured in the past, this task https://phab.starma.de/T2720 holds a link to many of them. It can give you clues about any other issues that were missed. Also keep in mind that we’re working on the weapon update too, the current offensive effects are not fully supported as some will be changed or removed only a few weeks after. The combination system will stay, but the combinations themselves can change drastically. We’ll make sure to post a dev blog about weapons specifically after the next public release. Please keep in mind that all config values are not 100% final yet. In case you encounter any oddities where specific mechanics are too strong or weak, please mention those and make sure to include a blueprint of the ship or structure were that is clearly the case. There is an all new power system in this build. Old ships are still loadable and fully usable but the old power and its related blocks are disabled in shops, creative mode and factories. They can be re-enabled in the block editor if needed (set inShop to true) or you can still access them through the admin command /give “player_name” “block_name” if you’re an admin, or in single player. There is an option in the ServerConfig to completely disable the old power system should a server admin want that. However, once a universe is started with the old power disabled, this option cannot be reverted, as that would lead to incompatibilities with the Structure and Reactor HP system and can lead to overheating of many structures. This is mainly for game worlds to be fully functional and for players to get accustomed to the new system without rendering all their creations suddenly completely non-functional. This systems makes ships work a lot differently. All ships made in the old power system, will not translate well into the new system. Simply swapping out the old power blocks with new ones does not make that ship functional again. Instead, we advise you to remove all power blocks, shields, thrusters and usables to start from a clean slate. On the surface, the new system is really simple. You have your main reactor blocks which add power recharge to your ship, only a single reactor group is active at any given time. Power capacity itself is fixed and low, as all weapons and systems use power over time. Weapons need a minimal amount of power to function, and require a lot more while they’re reloading. If you don’t have enough recharge, it will simply charge it slower. Other systems such as thrusters and jump drives, only use power when they’re in use. If your reactor group is small enough ( < 10 blocks), they work just fine on their own. You don’t need any additional blocks to make them function. However, larger reactors have deteriorating stability. They will not gain power recharge unless you fix their stability. For that, you need to place down stabilizer blocks. These blocks will work at most ranges, but to be efficient, they need to be placed a certain distance or further from your reactor. This distance increases with your reactor size, so make sure to keep an eye out on your stabilization when adjusting its size. The hud context in build mode will tell you exactly what that distance is and indicate the efficiency of your stabilizers, it also shows additional information based on what you’re using. While reactors have to be built grouped, stabilizers can be built distributed anywhere on your ship. If you have other inactive reactor groups, then all stabilizers look to the biggest reactor, and their resulting stabilization will be used. You can also build multiple reactors and switch between them. A reactor switch is instantaneous, but there is a cooldown to switch again and it also takes time for chambers to become active. As said, all modules now consume power over time. Additionally. you now have full control on what is going to be consumed first. Open the reactor panel (‘insert key’ default, or use the radial menu with tab), and you can prioritize certain systems. This means that they will get power first in case your total power consumption is above 100%. So if you prefer your shields and thrusters to work over your giant cannon, you can do that now. It also regulates power that goes into your docks or turrets, giving you more control over their power consumption. Most systems have a linear power consumption increase that depends on the group size. The few systems that have no group size, instead scale with the mass of your ship. Docked reactors will switch off on docking and all power needed is drawn from the mothership. This means, that turrets cannot have any power reactors on their own when docked. We will change the behavior a bit more in the weapon update to increase performance in battle and to add more versatility to docks and turrets. Ships now use reactor HP, which is based on the active reactor and the chambers connected to it. If you use multiple reactors, you can switch to a backup before your current reactor ends up overheating. As for the overheat mechanics, they’re similar to what you’ve known with structure HP but each reactor tracks its own HP. Reactors can only be scanned when they are active, so having a backup in another part of the ship can greatly increase survivability. Chambers are an all new feature to customize your ship with. We added over 100 different effects that you can activate with chambers. For this an all new effect system was implemented to enable fast and save management over network. Chambers can be imagined as a skill tree. Each reactor only has a limited chamber capacity which chambers consume based on their type and level. The difference to other skill trees is that here, you are physically building the tree yourself. You need to connect groups of chamber blocks with reactor conduits to the main reactor or to each other. Then you can open the reactor panel (‘insert key’ default, or use the radial menu with tab) and specify what exactly you want in your tree. The possible options will adapt based on what you build. Some functionality is now available by default, like the jump drive and the scanner. Chambers can be used to make these a lot more powerful. Each ship now has a recon strength and stealth strength only if the respective scan/stealth drives are active. The more recon you have over an enemy ship’s stealth strength, the more information you get about that ship. This ranges from simply seeing a cloaked ship to being able to see a ship’s reactor and weapons fully outlined. For the weapon update we plan to add more to it and tweak it were needed. Respectively, to cloak or radar jam you need a higher stealth strength than the other ship’s recon strength. Shields have been reworked into local shields. They now have a radius and only cover the blocks within. This includes docks. Only shields on the mothership will work to prevent abuse and maximize performance. The radius and recharge is based on the main recharger group, and so is its power consumption. The origin of the radius is the center of mass of that group and its capacity is determined from all shield capacity groups that are within the radius (up to 20 groups max). If a local shield radius falls into another recharger group, only the bigger recharger group will stay active. Shield damage that falls into blocks covered by multiple local shields will do damage to all of them. While adding an interesting mechanic, this system is mainly to avoid building ships in ‘islands’ that are very far apart as you would need multiple groups to cover them, making it more expensive and power intensive to maintain the same shield HP for each of them than you would get if it was a single more concentrated shield group. This is a measure to prevent exploiting certain system shapes without constricting free building too much. This as well as local shields are to solve general problems that already existed in the old power system in one form or another, and would translate and persist on the new system without these measures. This mechanic will likely not be relevant for most builders. It is to prevent building ships that are too spaced out, mainly abusing line patterns. Most systems will now have an integrity value. This values starts fairly high and is modified based on how the group is built. If any block does not touch enough other blocks of that group, it will lose integrity. If it touches enough (up to 6 max), it will gain integrity. It can be set to scale differently in the config, allowing us to make sure normal builds do not get affected. This means while single lines are now impossible to build while maintaining a positive integrity rating, anything “dense” enough is still ok.
Thrusters count their integrity all in one, meaning that a checkerboard pattern will be the fastest way to lose it. Shield integrity is based on the lowest integrity of the rechargers and capacity groups within that local shield. For weapons and other computer + modules, it’s a separate integrity value for each group although this will be tweaked in the weapons update. If integrity of a system is below zero, hitting that system will cause additional explosions across all groups of that same system. If a shielded ship with negative shield integrity is hit within its shield radius, the same will apply to the shield recharge groups and its capacity banks. This new block enables you to hover a certain distance away from anything physical. They act as an output for your onboard thrust, and require you to distribute an amount of thrust to them in the thrust configuration menu. They work well in any gravity field and when balanced right, allows you to hover any entity. Turrets can now be set to manual aiming. They will then automatically try to align themselves with where the pilot of the mothership is looking at. This includes looking around while using right shift (or double tapping right shift to make it sticky). You can of course also fire your turrets in this mode assignable from your weapon panel. Factories can now be set to limit production. The factory will also stop pulling resources when that happens, only keeping enough in storage for one extra production step. Additionally, storage blocks can now be set to limit the amount of blocks to store per type, to stop pulling once that is reached. We will continue work on refining the GUI and fix issues/exploits that come up that need fixing for an actual release. Some content such as the tutorial videos and block descriptions are still being worked on, but will be available on the actual release. Expect a first protoype dev build in ~2-3 weeks.